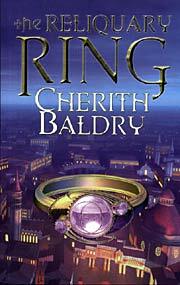 The Reliquary Ring by Cherith Baldry is set in an alternative Venice. It presents the saga of a number of families, whose fortunes ebb and flow while the city faces the threat of internal discontent and the spectre of a demonic uprising. As a historical drama it works brilliantly well, telling of Counts and Countesses and their family Houses, and cunningly told in large part from the point of view of the lowly servants. I heartily recommend it to anyone open to the idea of a fantasy/science fictional take on that kind of story. And if you're not sure, try it anyway--chances are you'll be won over. The Venice of The Reliquary Ring is essentially a non-technological city, but has begun to acquire technologies developed and sold by a mysterious empire in the north. The most noticeable example is the 'genics'--genetically engineered beings considered to be less than human. Some of the genics are human in appearance, and may possess extraordinary abilities, such as the ability to paint or a beautiful singing voice. Others are created for more functional purposes and may bear little resemblance to humans. For the most part, the genics and other technologies are purchased by the wealthy as servants or playthings. The Reliquary Ring itself is said to contain "the most holy of holy relics, a hair of the Lord Christos when he walked on earth." Events are set in motion when this ring comes into the possession of Count Dracone who seeks to use it in pursuit of power. The novel is greatly concerned with the reaction of the Church to this, and conveys a fierce compassion for those who struggle to understand the true meaning of the ring and the genics within their faith. When the city's aged Duke falls ill and the need to elect a replacement becomes an imminent prospect, Leonardo Loredan emerges as the most likely candidate to oppose Dracone. Count Loredan, however, finds himself under increasing scrutiny for supposed genic sympathies. More than this, he is rumoured to be engaged in an affair with the artist genic Gabriel. Indeed Gabriel does love Leonardo, but the relationship is complex and the depiction of their friendship is one of the great strengths of the book. The Reliquary Ring is classily written throughout. Perhaps the best example of this is a sequence in which Gabriel, who has led a sheltered life, goes out alone into the city. Captivated, he is moved to draw the people and places he sees. Baldry captures the nuances and details of this, describing in word pictures those things that Gabriel captures in his drawings. There are also some brilliant pieces of storytelling. Notably, we witness the events of the night of a carnival from the differing perspectives of a number of the characters--sometimes backtracking to earlier in the evening. There are two slight weaknesses in the book. The first is that Baldry seems disinterested in the technological elements of the story. For the most part, the technology arrives from the mysterious northern empire, with little in the way of scientific explanation. The second is that the main villain character lacks subtlety and is interesting only in terms of his impact on the other characters who are all far more believable than he is. This is a peculiar lapse because Baldry is certainly able to portray darkness with conviction in other aspects of the story. The Reliquary Ring is a thoroughly entertaining book, and presents a strikingly different approach to the fantasy novel. I hope that a great many readers--those who would normally read fantasy and those who normally wouldn't--will feel motivated to visit this "ancient maritime city" where they will find characters to care about, a clash of cultures, ethical dilemmas, cool flying machines, genics on land and in the sea, and demons erupting from the depths of hell. fiction - fiction by Cherith Baldry, including an extract from The Reliquary Ring. non-fiction - another review of The Reliquary Ring.